A flag of Mars is a flag or flag design that represents the planet Mars or that represents a fictional Martian government. Science fiction authors have, for literary purposes, described the flags of fictional Martian governments. Some of the readers of those flag descriptions have created flags or flag images that are based on the authors’ descriptions. Flag images for two fictional Martian governments are presented in this article. Advocates of the exploration and settlement of Mars have designed, manufactured, and sold Mars flags, sometimes with the hope that their designs may one day be adopted and used by real Martian governments. The most widely recognized flag of Mars was designed in 1998 by a planetary scientist named Pascal Lee. The Mars Society has manufactured and sold flags based on Lee’s design. Pascal Lee's flag of Mars. The proportions of the Flag of Mars are 2:3. In the Pantone Color Matching System (PCMS), the red should be the "Red Clay" 18-1454, the green the "Mint Green" 17-6333, and the blue the "Imperial Blue" 19-4245. Note: Pantone has red colors called "Mars Red" and "High Risk Red", but these appeared too dark and dull to me. The Pantone "Red Clay" is more orange and brown. It got my vote. Given the abundance of clays on Mars, "Red Clay" was also a good fit. The Pantone "Mint Green" seemed refreshingly primordial to me. It's more "algal" than other greens. The Pantone "Imperial Blue" also felt right. But yes, it's ironic that a celebration of Exploration and Liberty would end with Imperial Blue. The design of the flag was originally conceived by NASA planetary scientist Pascal Lee during the 1998 Haughton-Mars Project arctic expedition to Devon Island, Canada. In addition to symbolizing liberty as a tricolour flag, the design evokes a vision of the "future history" of Mars in which the planet is transformed from red, to green, and then blue like the Earth. The red bar, which lies closest to the mast, symbolizes Mars as it is today. The green and blue symbolize stages in the possible terraforming of Mars, should humanity ever have the ability and will to undertake such a task; the ethics of terraforming remaining a matter of debate. 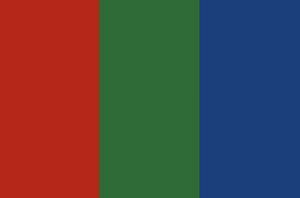 Kim Stanley Robinson's popular science-fiction trilogy Red Mars, Green Mars, and Blue Mars also provided inspiration for the flag. Beyond any human-induced terraforming, the color sequence also depicts the environmental change Mars might experience on astronomical timescales as the Sun evolves into a red giant and Mars becomes warmer. In the Pantone Color Matching System (PCMS), the red is the "Red Clay" (18-1454), the green is the "Mint Green" (17-6333), and the blue is the "Imperial Blue" (19-4245). The flag was first displayed and flown at the Haughton-Mars Project Research Station (HMPRS) in summer 1998, and then on the Mars Society's Flashline Mars Arctic Research Station (FMARS) in summer 2000. 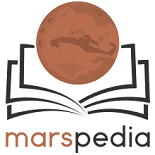 The flag is widely used by the Mars Society and The Planetary Society. It is displayed in several locations on the Mars Society's Mars Desert Research Station campus in Utah. A version of the Flag of Mars sewn by Maggie Zubrin specifically to be flown in space, was carried aboard the space shuttle Discovery by astronaut John M. Grunsfeld on STS-103 in 1999. The flag is also used as a sew on patch on concept spacesuits used in Mars mission simulations. The flag is also used in research laboratories on Mars in Caiçara do Rio do Vento in Brazil. There is no official flag for Mars since there is no government or other authority in existence capable of adopting such a flag. In addition, the Outer Space Treaty states in Article II that "outer space, including the Moon and other celestial bodies, are not subject to national appropriation by claim of sovereignty, by means of use or occupation, or by any other means." Whilst this specifically prohibits "national appropriation" of extraterrestrial territory by nations, it does not specifically outlaw such appropriation by other entities, such as companies or individuals. Such claims are currently speculative, as there is no human population in-situ to enforce them, but this is the basis on which some companies claim to sell extraterrestrial real estate. 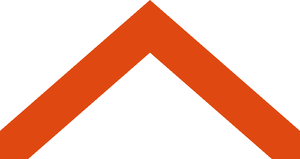 Calder Hansen's flag of Mars. It stands out from other flags. The flag for an entire planet should not be hard to distinguish from the flags of individual countries. Lee’s flag is a triband flag, and as such it does not stand out from the many national triband flags in existence. The new flag, however, is memorable and distinct from other flags. The color values provide contrast. A common design principle is to use both light and dark colors, rather than only light or only dark colors. This principle is supported by the North American Vexillological Association (vexillology: the study of flags), which says that “contrast is important — use light colors on dark, and vice-versa.” Lee’s flag uses only dark colors of a similar value, not providing much contrast. The new flag uses a dark color (red) on a light color (white), resulting in a contrast that enlivens the design and draws one’s eye. Its meaning does not depend on the order of its parts. The meaning of Lee’s flag comes from looking at the stripes from left to right, going from red to green to blue. If you speak a language that is written from right to left (such as Arabic or Hebrew), you will read it in the opposite order and the meaning will be reversed. We hope that colonizing Mars will be an international endeavor; therefore, the meaning of the flag should not depend on where one is from. Additionally, one often sees a flag from behind, which would cause the same reversal of meaning in Lee’s flag but would not cause a problem with the new flag. This page was last edited on 20 December 2018, at 10:07.